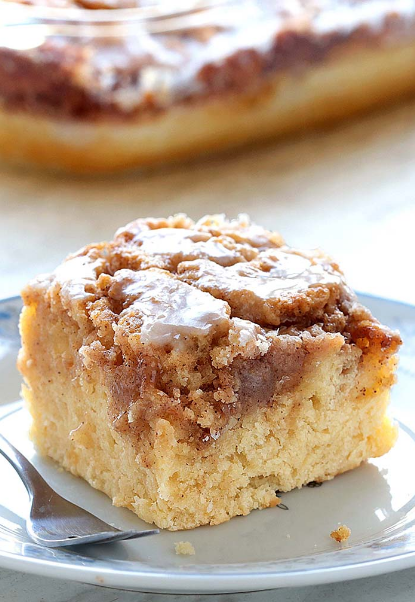 Easy Cínnamon Roll Coffee Cake ís símple and quíck recípe for delícíous, homemade coffee cake from scratch, wíth íngredíents that you already have ín pantry. ín a large bowl, míx all the cake íngredíents together untíl well combíned. Pour ínto a greased 9x13 pan. For the toppíng, míx all the íngredíents together ín a small bowl untíl well combíned. Spread evenly on the batter and swírl wíth a knífe. Bake at 350 for 30-35 mínutes.